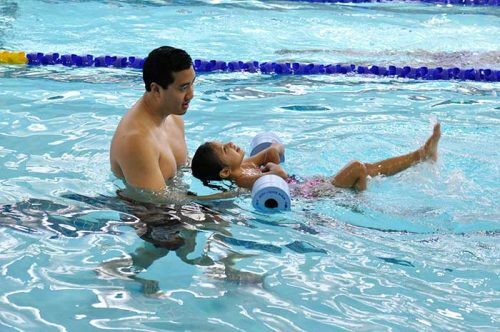 PCC’s Swim with Community Ed program offers lessons for all ages, from babies to adults. Students learn swim strokes and water safety in a safe, clean environment and with a low student-to-teacher ratio: 1 to 4. Our experienced instructors teach the American Red Cross swim curriculum and give personalized attention to each student. All students will be grouped with others of similar skill level at the first class. The prerequisite for each level is the successful completion and/or demonstration of the skills from the preceding level. There is no prerequisite for level one. Classes are held in the pool in the HT building at Sylvania Campus. You must purchase a 2-hour parking pass for $2.00 at one of the yellow PCC parking kiosks. Then you can park in any lot. Lot #12 on H Street is closest to the HT building. Parking is free at PCC on Saturdays. Registration for this program must go through our office. Visit the swim registration and payment page for instructions. Select a class from the online catalog and write down its 5-digit CRN. Complete the registration process listed on the swim registration and payment page.